All Seasons Pest Control has more than 40 years experience helping you rid your home of Carpenter Ants. Our staff will help you confirm the identify of the invading species, develop a comprehensive treatment plan and monitor against future infestations. There are more than 1,000 species of carpenter ants. The species most common to Northern New Jersey is the black carpenter ant. In fact 100% of the Carpenter Ant treatments performed by All Seasons Pest Control have been for this species. Unlike termites, carpenter ants do not eat wood, but like termites they can cause considerable damage to wooden structures. Carpenter Ants excavate wood to create space for their colony. This pest prefers damp wood, and in its natural environment would makes its home inside fallen trees. The concern for homeowners is that carpenter ants will select a structural piece of damp lumber in the home to make a colony. Left untreated, this type of infestation can compromise the integrity of the home’s structure. There are many “natural” remedies available at your local hardware store which claim to solve Carpenter Ant problems. Some of these include diatomaceous earth, or boric acid. Many of these treatments have a place in part of an overall integrated pest management program, but tend not to produce the results sought in the time desired. 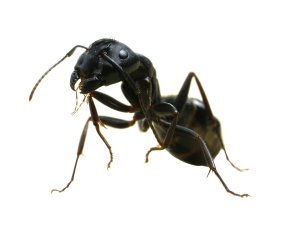 In order to truly resolve a Carpenter Ant infestation, a comprehensive approach is required. All Seasons Pest Control can help you implement a pest management program that includes interior treatment, exterior treatment, and monitoring. This approach will protect your investment in your home and your family’s peace of mind. Carpenter Ants are Large Dark Ants that can Damage Wood in and Outside of your Home or Business. Carpenter Ants leave a sawdust-like material behind known as frass that provides clues to their nesting location. Unlike termite-damaged areas, Carpenter Ant galleries or holes are smooth and have mud packed into the hollowed out areas. Carpenter Ant species reside both outdoors and indoors in moist, decaying or hollow wood. They cut galleries into the wood grain to provide passageways for movement from section to section of the nest. Certain sections of buildings, such as around and under windows, roof eaves, decks and porches, are more susceptible to infestation because these areas are most vulnerable to moisture. If you suspect a Carpenter Ant issue, don’t delay, call today for prompt, professional attention.